Note: While this review will be spoiler free, it will refer to events from the previous book.If you haven’t started this series yet, check out Chelsea’s review of Full Blooded. With Full Blooded being one of mine (and Chelsea’s) favorites of 2012, you can bet that Hot Blooded was one of my most eagerly anticipated for 2013. It didn’t disappoint, mostly because it’s bloody brilliant. After an ancient goddess kidnaps her mate, Jessica McClain, the only female werewolf, is ready to do whatever it takes to get him back. Thirty-six hours after she swore an oath to the vampire queen in exchange for assistance, Jess is ready to hit the road and find Rourke. Backing her up is her twin brother Tyler, packmate Danny and, surprisingly, police Detective Ray Hart, a.k.a. the very human thorn in her side. But Rourke’s kidnapper Selene was never going to make it easy, as this band of rescuers soon find out as they go up against one of the most powerful sorceress to have ever lived. Hot Blooded is a super-charged quest, as Jess & Co. come up against multiple mythological creatures, each obstacle a dangerous battle, leading to a pretty epic showdown. The supernatural mythology doesn’t just expand in the second book of this series, it positively explodes! Selene’s influence can be felt throughout, stretching to hellish minions and powerful enchantments. We get better acquainted with the vampires, as the sibling trackers, promised by the queen, join the group. I loved the internal interactions, particularly between the female vamp Naomi and the wolves. Ray is hilarious in his stubbornness, going on to be one of my favorite characters, alongside the oh-so-charming Danny. There isn’t a huge amount of Rourke in this book (he’s busy being all kidnapped), but for me that was okay. Not because I didn’t want him around (I most certainly do! ), but because it gave Jess the chance to figure out who she is and where she stands in this world, on her own. I felt her anger and desperation to find him, fuelling her through a huge learning curve. This journey gave her the opportunity to test her abilities away from the prying eyes of the supernatural community. I found the interactions between Jess and her wolf so easy to visualize and loved watching them begin to realize their potential as a team. As more information comes to light about the Cain myth that has haunted Jess her entire life, it begins to look like she could be more powerful than anyone imagined. There are fascinating shifts in pack dynamics particularly between Jess and her family that will have far reaching consequences. Jess is straying into uncharted territory and will need all the bonds she forges in Hot Blooded to navigate it. The supernatural world has its eye on Jessica McClain and I can’t wait to see how it plays out in future books! 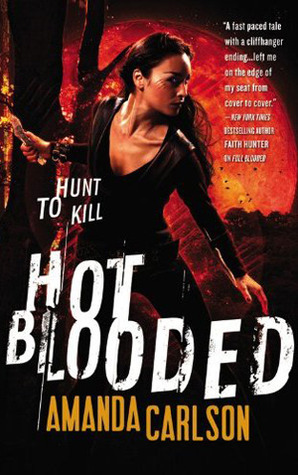 Hot Blooded is a fantastic addition to a series that has basically everything I want from my urban fantasy: Layered world-building, pulse-racing action, witty writing and characters that grow. If, like me, you were left missing Kelley Armstrong’s Women of the Otherworld when it ended, this may just be the series to help you fill that void. I’m counting down the days until Cold Blooded. Multiple mythological creatures? Saweeeet. Glad to see time apart allows Jess some serious growth, and I can’t wait to experience it! I am so looking forward to this one as just finished book one today and aargh that ending!!!! Best new to me series since the end of both Armstrongs werewolves and witches and Vincent’s Shifters, Jessica has now tied with Faythe in my affection for female leads in a book. Yay! I really enjoyed this book, always so fun! I also can’t wait to read more now! I absolutely loved the first one in this series. I’m relatively new to urban fantasy and am enjoying getting through series at more than 5 books long but it feels great to be in on the beginning of what seems to be an amazing series. I’m waiting impatiently for this one. On a side note I didn’t enjoy the first book of Kelley Armstrong’s otherworld series (haven’t tried the rest) so have avoided werewolves a bit but I’m glad I tried this. It’s a fab genre isn’t it?! Which series have you been enjoying? Sorry to hear you didn’t get on with Bitten, although you might enjoy the other books in the Women of the Otherworld series, as the world building really expands in the second book (vampire, witches and other supernaturals are introduced). Have you had a look at VBC’s Recommendations pages?